Above is a quick look at the crowds and action on 34th Street during Fashion's Night Out 2011 at the start of the night. After we caught Sam Ronson posing on the Macy's Herald Square red carpet and giving the paparazzi the bird (an excellent contrast to Miss New York who posing next to her), I headed into JCPenney Manhattan Mall for their "Miss for a Must" event. See that MNG by Mango scarf with the red flowers below? It's my fashion "must" pick from JCPenney's Fashion's Night Out event with People StyleWatch. Guests traded in a "miss" for a "must," but more on that later..
Scarves are always a must for me. Another must that night? 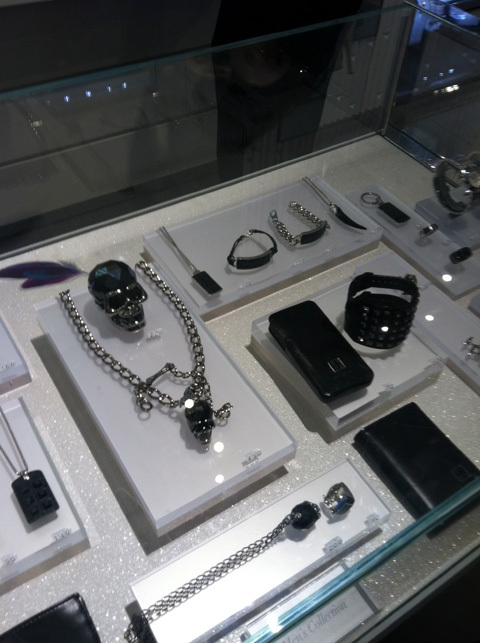 A stop by the 34th Street Swarovski boutique for champagne and ogling of the skull bling for men. 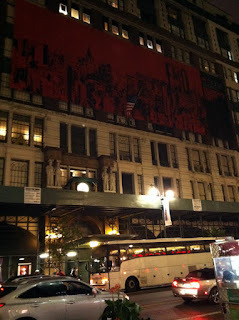 On the way to my train I also ogled and admired the enormous Fashion's Night Out banner on Macy's 34th Street facade. Hey, that's how Macy's rolls. And to wrap up Fashion's Night Out 2011, here's the winner of the $50 Macy's gift certificate: StrangeDaze! Congrats to StrangeDaze, and thanks to everyone who entered. Keep coming back for more contests, there will be another one soon!